This review originally appeared on rpg.net in May 2012 and was reprinted in the September/October 2017 issue. “At last we shall reveal ourselves to the Jedi…” wait a minute… same genre, different game… but this is kind of how this supplement feels: it’s the big reveal after countless Quick Worlds that have been assembled into subsector guides. This is the base setting for all these worlds and the polity that connects them together. Hub Federation is an appropriate name; the previous two subsector guides act as spokes that radiate outward organically from this supplement. While it does deal with the government/interstellar polity, the focus seems to actually be on the worlds that are heavily connected back to the initial colonization effort spurred by the discovery of a wormhole located some 10.5 light years from Earth. Once scientists figured out how to widen the wormhole from a few millimetres to something capable of transporting a probe, a whole new colonization effort was born with ships travelling across to the other side of the galaxy using the conduit and a modified Jump Drive (called the Zimm Drive, or Z-Drive, which can only perform as a J-2). Then, suddenly, the wormhole collapsed leaving an emergent civilization to fend for itself in the Wilds far from home. There are several plot points left to the Referee’s determination: What was the nature of the wormhole? Artificial? Real? Could it be brought back or is there another one out there? Like previous offerings from Gypsy Knight Games, all suggestions are voluntary and leave the Referee in charge. 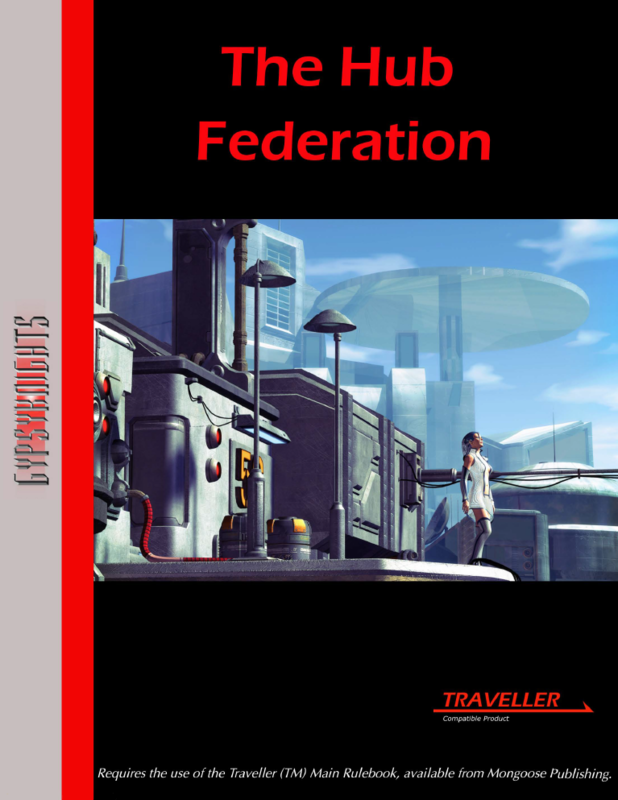 Given that Germans led the way in the colonization effort, there are worlds with a German tinge – but what was disappointing was that no attempt to model the Hub Federation on the Federal Republic except in a cursory way was ever attempted. Doing so would have provided an “alien” yet familiar concept of government for many Americans – who rightly or wrongly believe in weaker central governments than what has happened in Germany. Like the predecessor subsector guides, this is a collection of worlds. Where they differ is that they are less Southern California or less Star Trek; however, they do suffer somewhat from being still in the habitable zones replete with breathable atmospheres even if they look like rock balls. But once again, this was noted as a general problem for Traveller, so no slight to Gypsy Knight Games—but I do hope that you will begin to tweak your worlds to make them more exotic locales utilizing different atmospheres or different habitats like Space Cities or Asteroid habitations or worlds that are merely refineries – company towns or Outland type settlements. Another minor source of annoyance is indeed that travel has been limited to J-2. I realize that this has been done to create a small-ship universe and limit the reach of the central authorities over the frontier, but in Traveller communication moves only as fast as travel and even at J-6 lots of autonomy must be placed in the hands of local authorities – I suspect they did not want to invent an artificial glue to hold their ATU together (the OTU uses the premise that Feudalism has returned as a social glue). The worlds themselves are interesting, but none particularly stand out as unique other than the capital world of Hub, although, I suspect, I am facing a little burnout from reading many similar world descriptions based in the Hard Space Opera genre. The illustrations both of the star systems and the unfolded icosahedral world maps are really first rate. Initially, the interior art of people and places seemed a tad high tech, but it makes more sense as upper TL is now broaching C or Average Interstellar Polity in standard Traveller terms. The writing is clear and spot on with its descriptions – things are purposely left to the Referee to determine. That said, there are adventure seeds aplenty and other things to help the Referee to plot out escapades and exploits. If there is a drawback, it is that 21 Organizations was not directly incorporated into this book (which is for the most part a modified careers book). This would have added to the price but much more to the value of the item – having to buy them separately has some merit but together would have made the product stronger. Also, why not illustrate some of the more fantastical things or things that give a Sense of Wonder for the Core Worlds? This may have been fine to exclude in the frontier but one has to identify more Science Fiction tropes and give the motivation for Travellers to feel or experience something different. On the plus, side, each world has a unique history and well connected with others. Thus making this game to be more connected than the standard Traveller geographical sourcebook which treats each world as a self-contained monad. All in all, this entire supplement is worth the money, if you like what Gypsy Knights Games is attempting to do, which is create the solitary worlds and string them together in a fragile alliance, thus creating lots for the Bride and her groom (Referee and Players). Many mysteries of the milieu are touched on, but only the Keeper can decipher truth from fiction, and set up the journeys that are sure to follow.